Hello, hello! 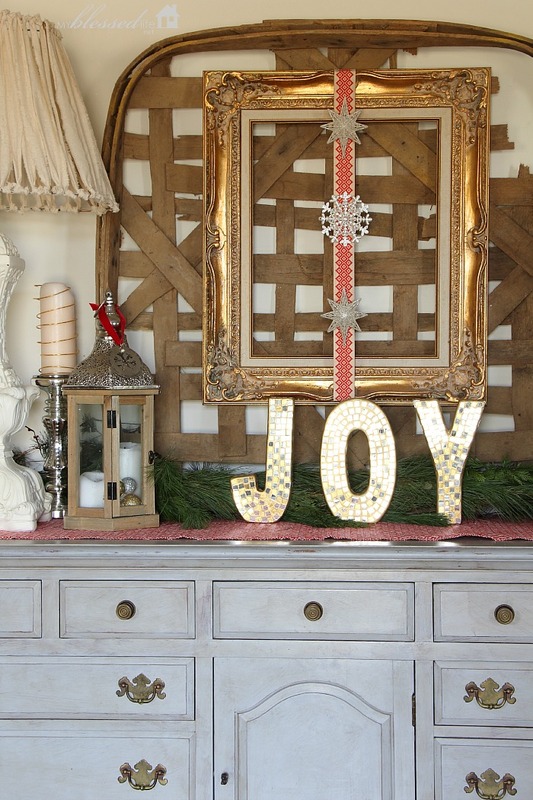 I’m so excited to be a part of the Holiday Home Tour hosted by Chris at Just A Girl! 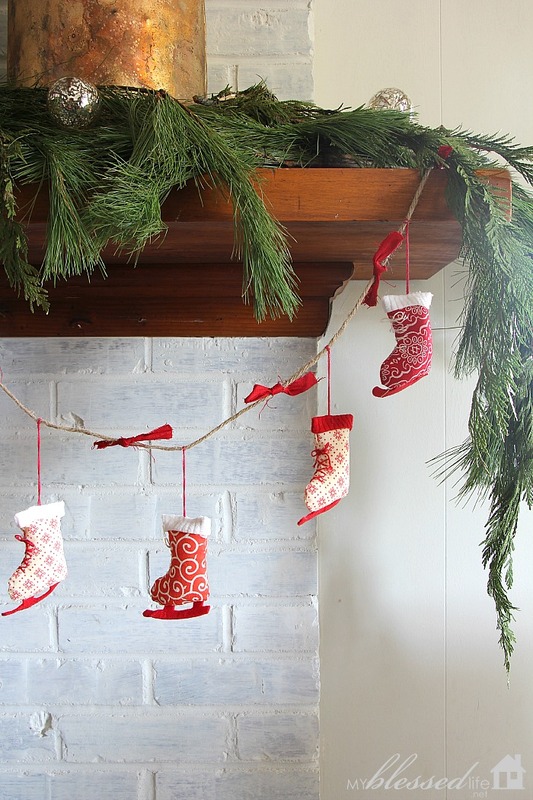 I love getting a peek into how others decorate their homes for Christmas, don’t you? 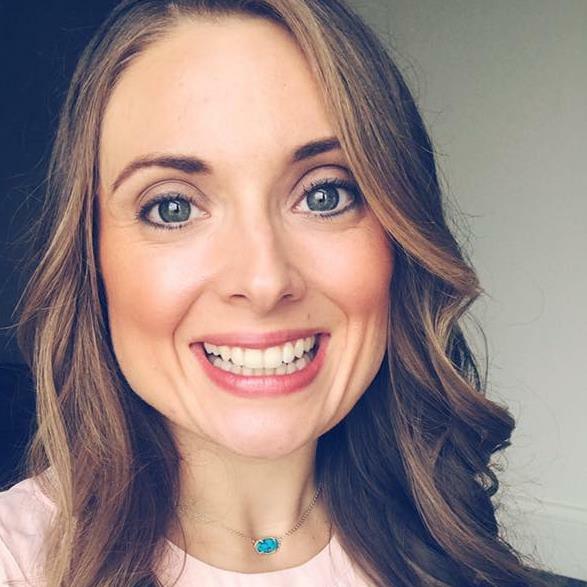 A special welcome to you if you are visiting from Stacy’s lovely place. 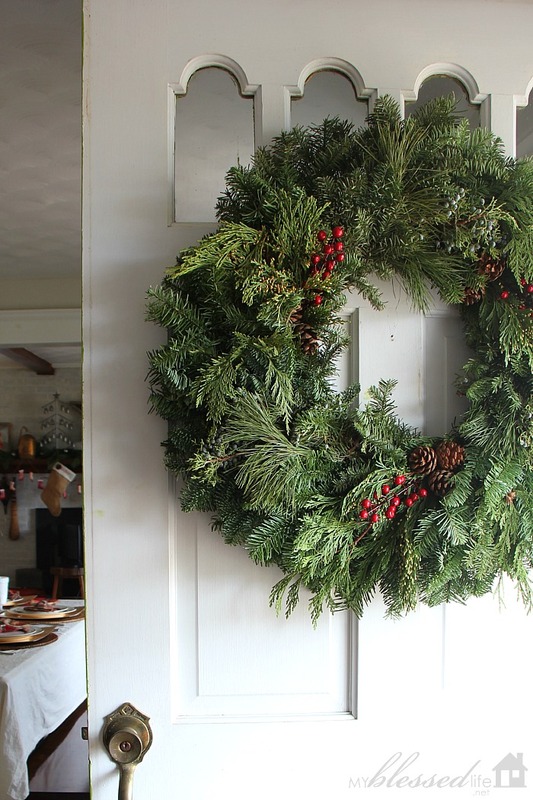 I’m excited to show you how I’ve decorated our little home in the country. This is my absolute, hands down favorite time of year. 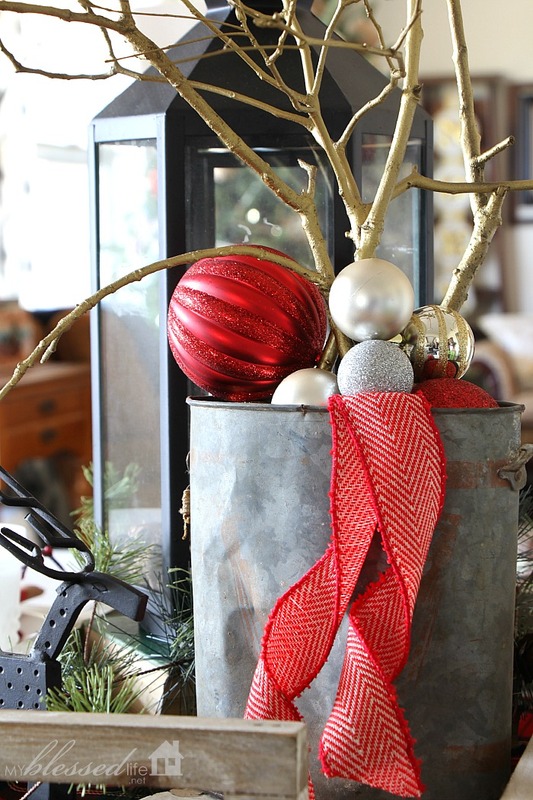 My style is eclectic, layered, cozy and what I like to call rustic glam. I don’t know if that’s an official style, but it’s me. 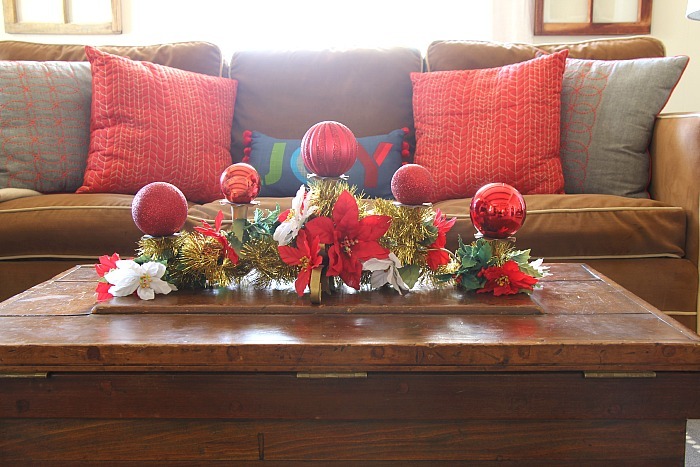 My dad says my decorating is like “I Spy” — You always see something different. Haha! The tree is my favorite. 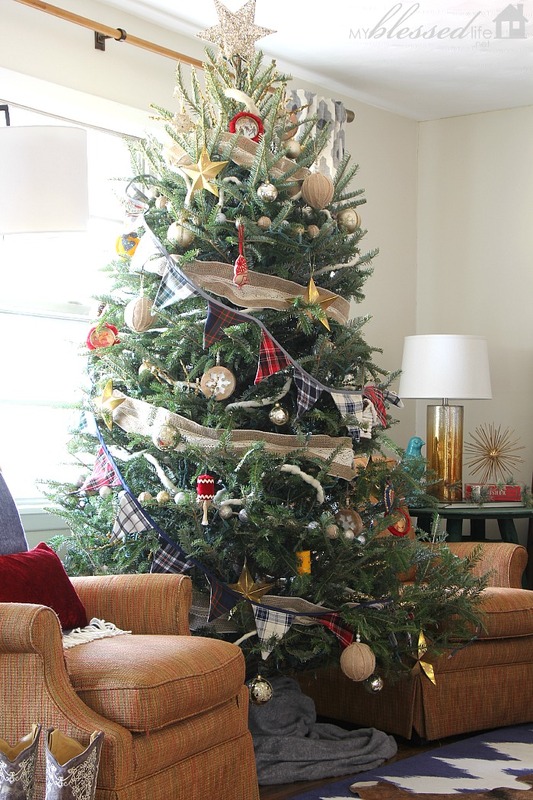 It includes a few handmade ornaments that always decorated Memaw’s tree. I also decided to add the tartan plaid pennant banner that I made last year. I bought live garland for the first time this year. It was the best decision ever according to my momma. 🙂 I agree. 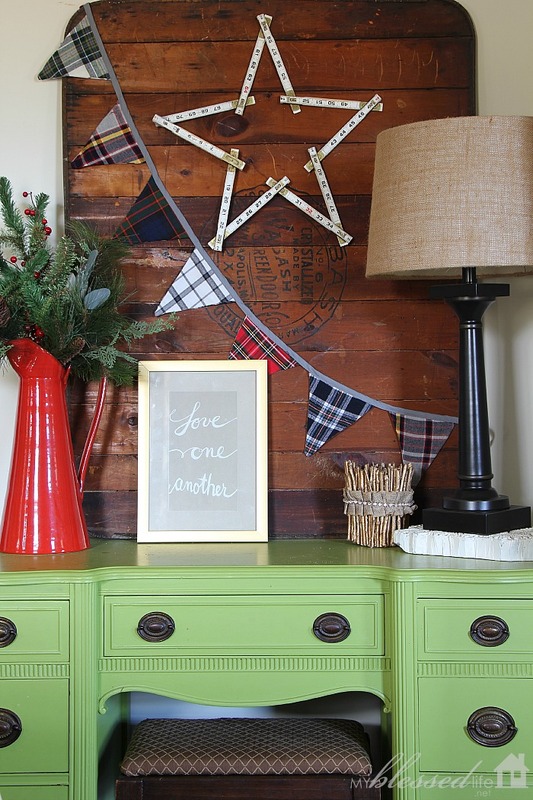 Mixing plaids is so much fun! My favorite things on the table are Memaw’s milk glass glasses. We actually got curtains hung last week. I feel like such a legit adult now. Haha! Now we just need blinds. What can I say? It’s a benefit of living in the boonies? This year I was drawn to decorating with stars for some reason. They are cheerful and full of light…makes me happy! More live garland. The best! 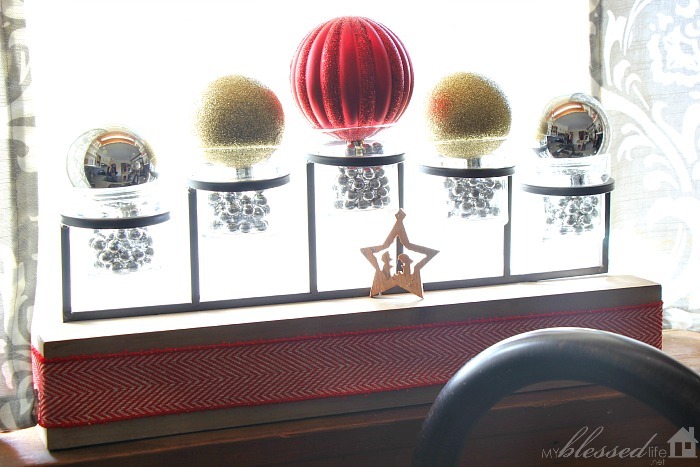 I added a few pops of Christmas in the front bathroom that we completely gutted almost a year ago. It’s such a bright and happy space. And it has the most awesome floor. This is what you call “kid friendly” decor. 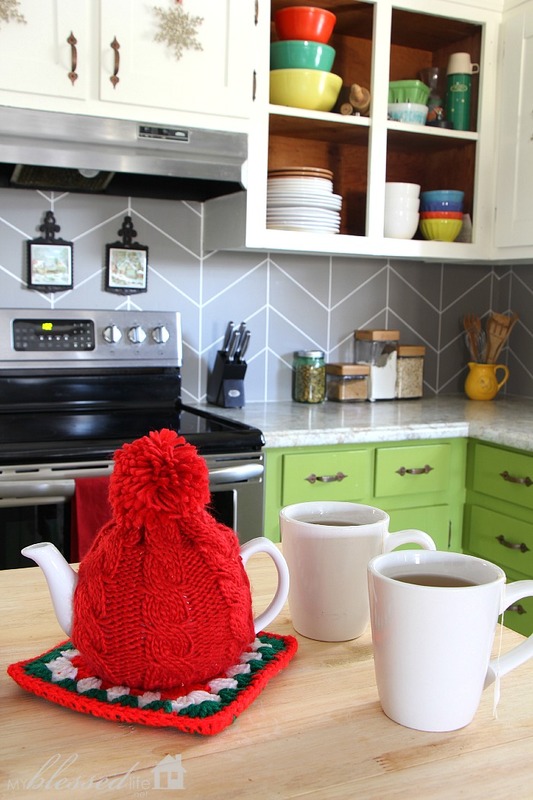 We recently completed the backsplash makeover. It’s all done with paint. I saw this teapot at Pier 1 a few weeks ago when I was out shopping with my mom. I couldn’t get it out of my mind, so I went back and got the very last one they had. I love it! Memaw always had a gum drop tree. She spray painted a branch for many years, so I revived that tradition this year. This is probably the world’s most epic gum drop tree. Haha! We very recently added this kitchen island. It’s a “make do” until we can build an island to include a dishwasher. Oh my word, that will be a happy day. Thanks so much for stopping by for a look! 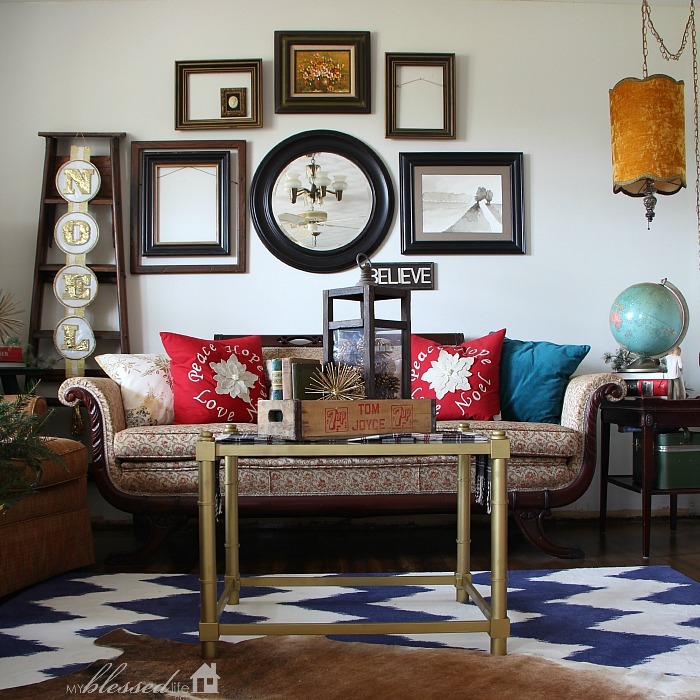 Your next stop on the Holiday Home Tour is Erin’s beautiful home. 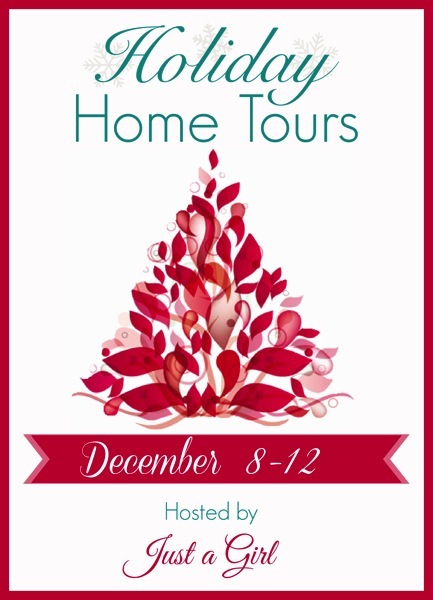 To see ALL the homes on tour this year, click here! Sharing at Tidy Mom‘s party! 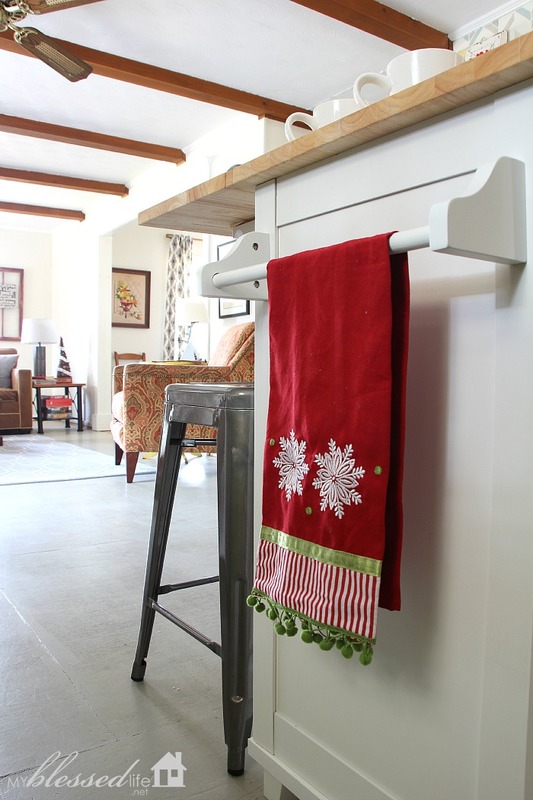 OH MY……I love everything about your Holiday Home Tour! 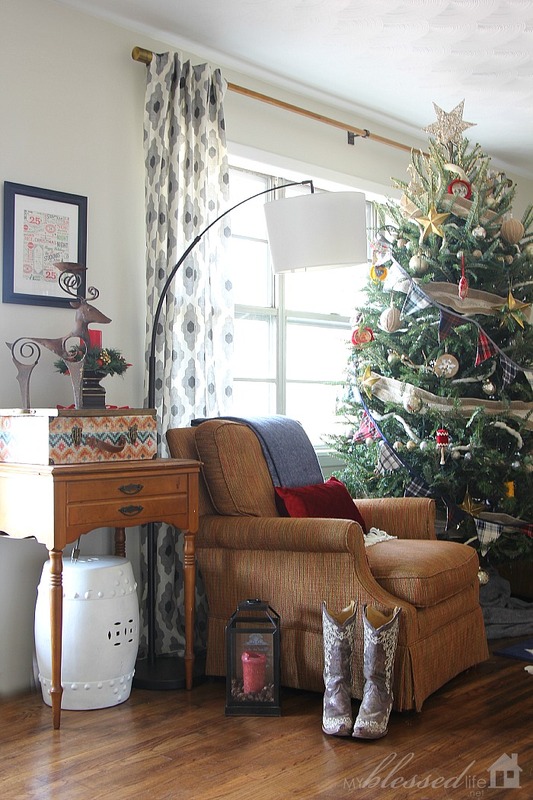 If I had to pick favorites – and that’s hard to do because there’s so many wonderful things – I would have to pick the tree (love those sentimental ornaments! 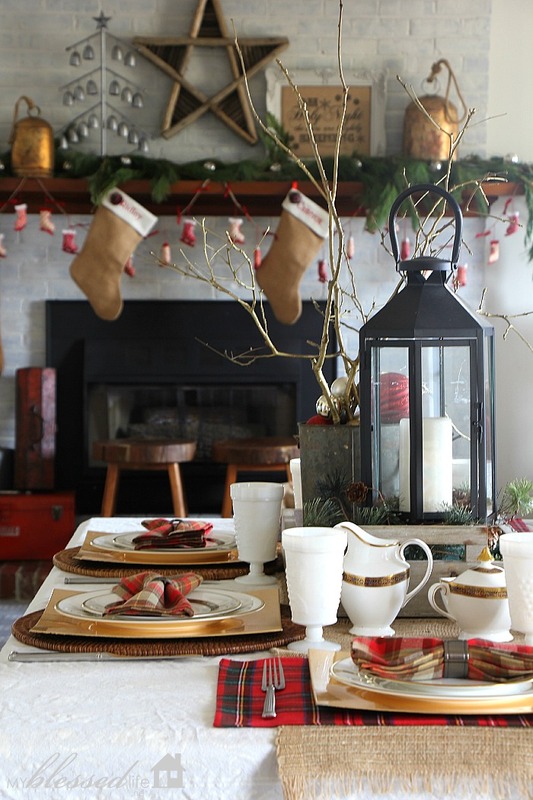 ), your Christmas table and the holiday vignettes you’ve created on the gray buffet and the apple green desk!! 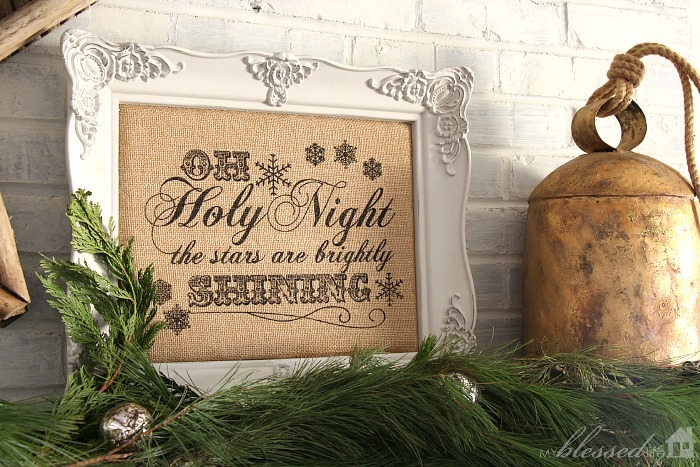 Another favorite is the “O Holy Night” burlap print…..love! 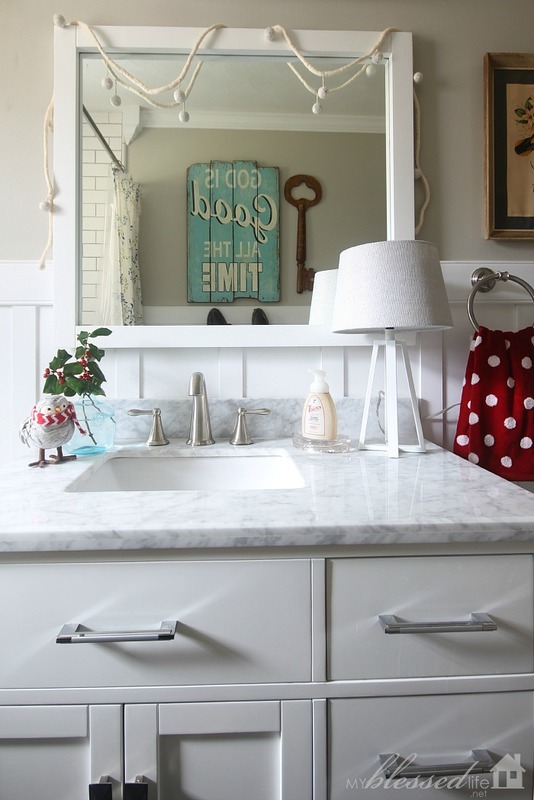 Thanks for the inspiration and for sharing….I think I agree with your Dad about “I Spy”, but I love it! Hope you and your family have a wonderful Christmas!! Gorgeous, as always, Myra!! Love it! Myra, your home is absolutely lovely. 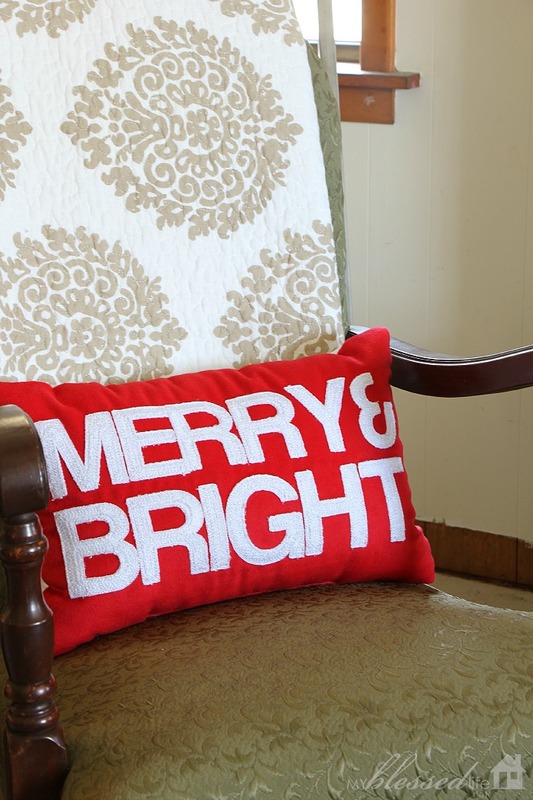 And I love the “O, Holy Night” on burlap. Is this your design or is a printable that I could find somewhere? I would love to make a few for my family. I’ve been following your blog since at least 2009…and it’s so fun to see how your style has changed and evolved. I loved your decor then and I love it now. 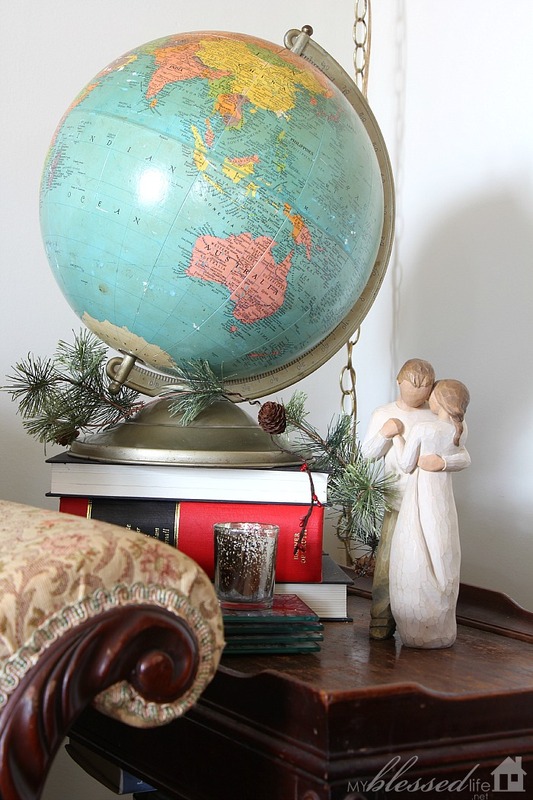 I especially love how you utilize your family treasures! Very pretty Myra!! I love the gumdrop tree. My sis in law gave me one of the acrylic kind and I put it next to my gingerbread house where I LOVE it. Now I want another tree or two. May have to steal your idea! This is SO beautiful! It looks so put-together but at the same time so comfortable and homey. I love your style! And I love those new curtains–I am hoping to do that in the new year too! Myra, it is all just beautiful. I’m still so tickled for you that you are in your grandmother’s house. It’s coming together so well for you. Merry Christmas, my friend!! Beautiful!!! So homey. The gum drops tree brings back memories… Sweet ones! So much to love! 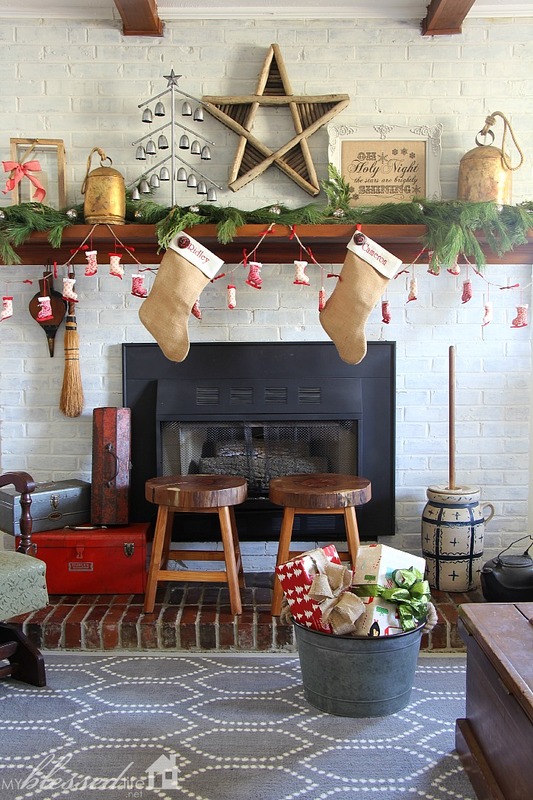 The whole fireplace setup is so perfect and cozy. 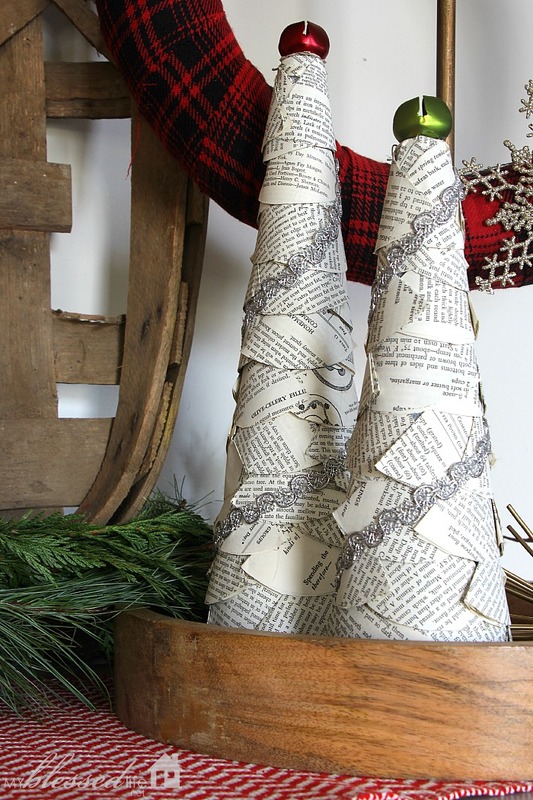 Love all the greenery you used too! So pretty! 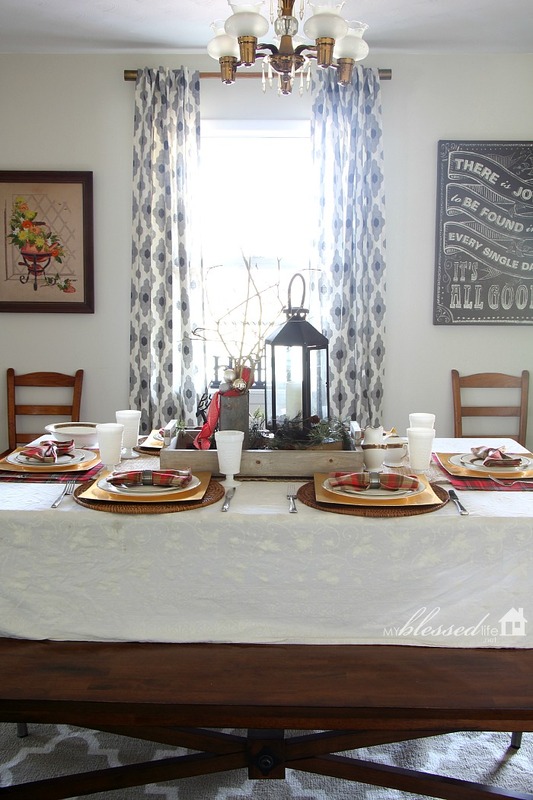 I love all the plaid on the table setting! I’m mad for plaid 😉 My grandmother always had gum drop tree too! Her tree was plastic but I love your spray painted version. Potential dumb question: Would it be safe to eat the gum drops off the spray painted branches? There’s no way I could have a gum drop tree around and expect my little ones to not nibble! Hey! Definitely DON’T eat gum drops off of spray painted branches. 🙂 Our tree is on the kitchen island and it hasn’t been a temptation so far. I figured as much!!! Thank you so much for your response! Happy Holidays! Your home is so beautiful, Myra. I love it. What a blessing to live in your grandparents home. 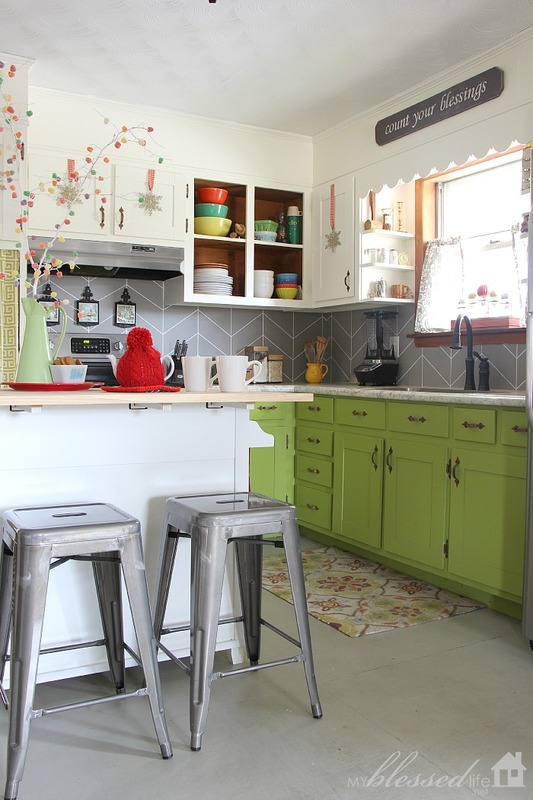 I ADORE those milk glass glasses. It looks great and thanks for sharing. Meemaw!!!! You did it again! I am soooooo going to do a gumdrop tree. I will always think of Meemaw and you! just gorgeous Myra! I love every little detail! Absolutely Beautiful! 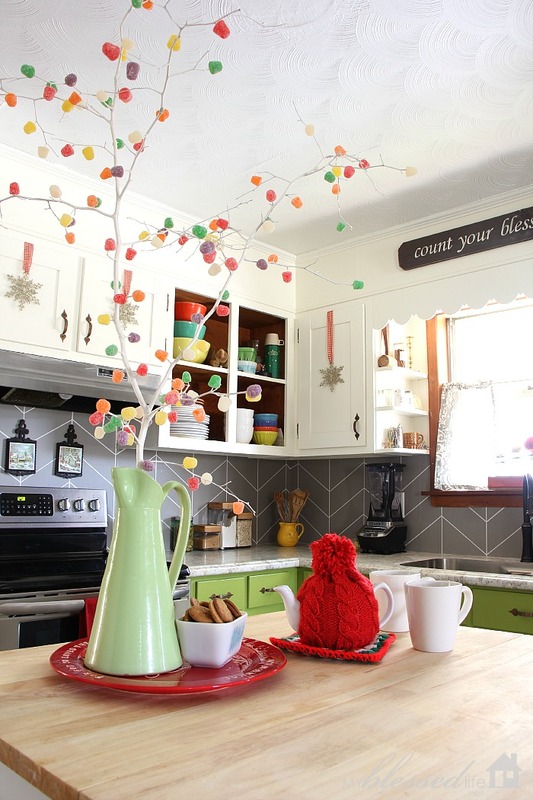 I love that gumdrop tree! 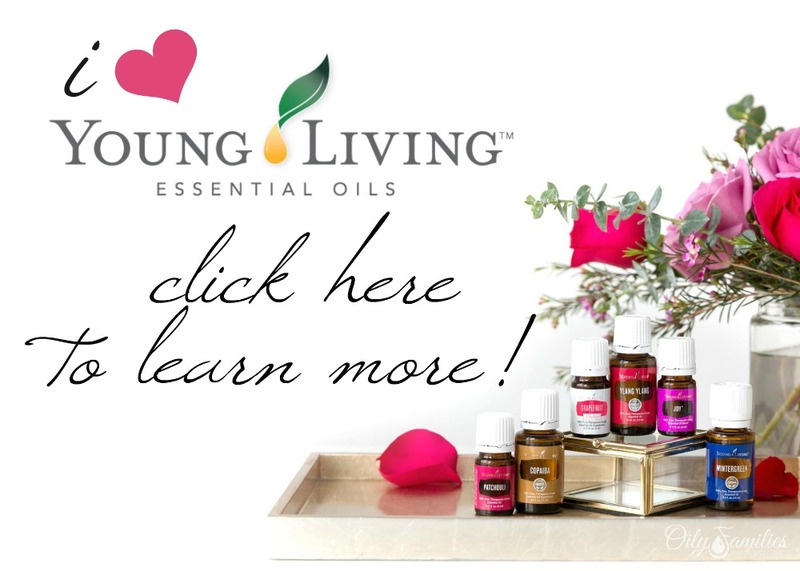 Love it all–it speaks to me and makes me smile! Hi there! 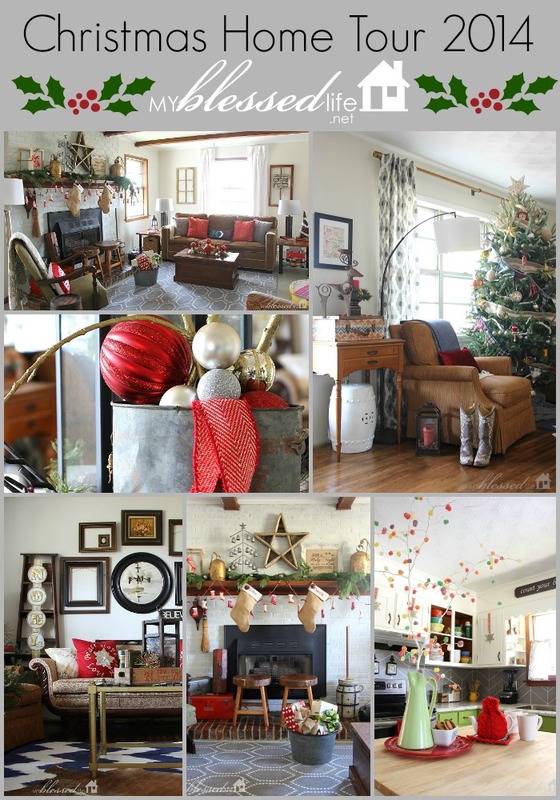 Beautiful photos of all of your decorations! 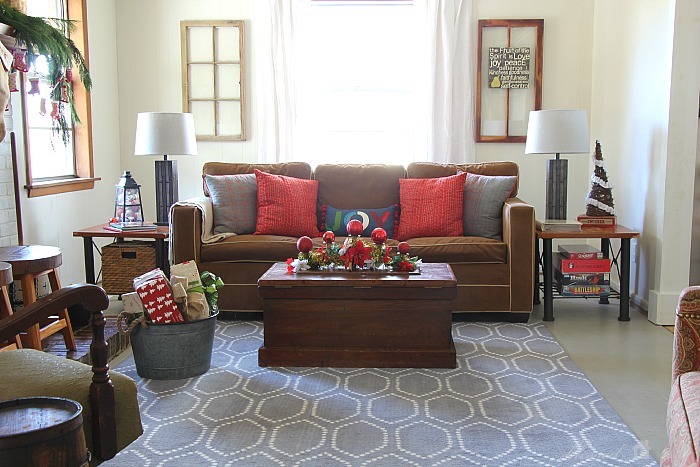 I have to ask–can you tell me where the cute rug is from? The gray one with the white dot hexagons?? I love it! Really very very pretty Myra! The Holiday Home Tour was really very adorable and a cute day! Absolutely I love all of your pictures whose you have shown us. Check out MyToolsLab, they committed to building the Tools appliance resources on the internet, including review and guideline.